Starting with the winner of the coin toss, players now take turns playing POWER OPTION cards on the POWER PORT, one card per turn. Each Power Option card has an EFFECT that you can use to try for an advantage over your opponent. Some Power Option cards have Use Requirements attached to their Effect. You must complete these Use Requirements as part of your turn for the Effect to come into play. Keep track of how the dueling Digimon's relative strength changes with each card played, as shown by comparing DIGIMON POWER. Continue taking turns until a player runs out of Power Option cards to play, or decides to stop playing them, and says Pass. The other player may continue to play Power Option cards until he or she runs out of cards or decides to stop. Winner keeps all Digimon on the DUEL ZONE. Defeated player sends all Digimon, except the Rookie, OFFLINE. Both players send all Power Option cards Offline. 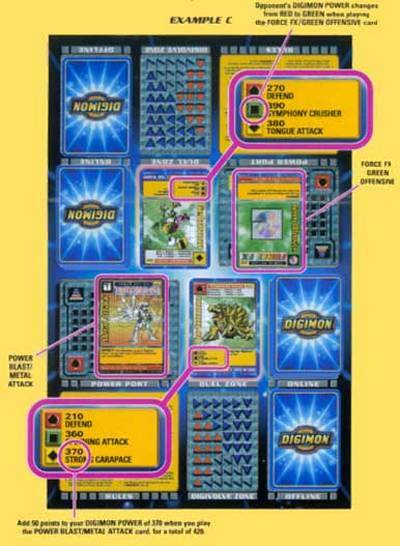 In the event of a tie, all Digimon remain on the Duel Zone and all Power Option cards are sent Offline. No points are scored. Winner of the previous Duel (or of the coin toss) goes first in the next Duel. The first player to score 1,000 points wins the game. In EXAMPLE C, your opponent battles back, placing a FORCE FX/GREEN OFFENSIVE card on the POWER PORT. This has the EFFECT of changing his or her Digimon Power to (GREEN). That means he or she now blasts you with Digimon Power of 390 against your 370, giving him or her the advantage. You counter with a POWER BLAST/METAL ATTACK card that has the EFFECT of adding 50 points to your Digimon Power, giving you 420 to his or her 390. Your opponent examines his or her hand, sees he or she is out of options and passes. You win the Duel! To determine your score, see the SCORE chart at the bottom of your winning Digimon card. Since your opponent was a Champion, find "C" for Champion and see that you've won 100 points. Add the points to your Score Counter.